News, reviews, & commentary on contemporary religious history with a focus on Germany & Europe in the twentieth and twenty-first centuries. Review of Roger P. Minert, In Harm’s Way. East German Latter-day Saints in World War II (Provo, Utah: Religious Studies Center, Brigham Young University, 2009) 545 pp. ISBN 878-0-8425-2746-0.
period of its final catastrophic ending in 1945-6. This account thus focuses on the time before the imposition of communist rule in the German Democratic Republic, but foreshadows that much-dreaded development. Rather than investigating the relationship of the Church to the governmental authorities, Minert’s interest is limited to describing in detail the lives of individual Mormons. He concentrates on a biographical approach, seeking to identify and record the experiences and witness of as many as possible of the ordinary members of each branch of the Church, and to draw up a complete listing of all who died during this period. To this end, he began, fifty years after these dramatic events, to interview all available surviving eyewitnesses, to locate biographies or autobiographies by or about eyewitnesses, and to study all available church records. Out of some thirteen thousand German members in 1939, he obtained interviews with five hundred survivors, who in turn also supplied first-person narratives or written stories of their own lives or those of deceased relatives. Mormons have a strong interest in genealogy. So the records held in Salt Lake City, Utah, provide the historian with much help in linking family histories together. In addition many of the East German mission records for this period survived intact. (It is however not clear from his text why his study was limited solely to the East German Mission). The East German Mormon community, divided into districts and branches (or local parishes) was almost entirely an urban and lower-class phenomenon. These congregations contained almost no professional people. Most of the men were labourers or craftsmen. Only a few possessed their own meeting places, mostly using renting rooms in office-buildings in unremarkable parts of town. But their working-class solidarity was compounded by their loyalty to their fellow Mormons. The pattern of church organization, introduced from the United States, was largely patriarchal, while spiritual authority rested in men chosen or appointed for their dedication to the Mormon beliefs. After all American missionaries were withdrawn in August 1939, the local branches became more dependent on each other. On the other hand, the conscription of all the younger male members into the German armed forces left many branches without leadership. In many cases, it was years before these men returned from prisoner-of-war camps. In many other cases, they never came back. 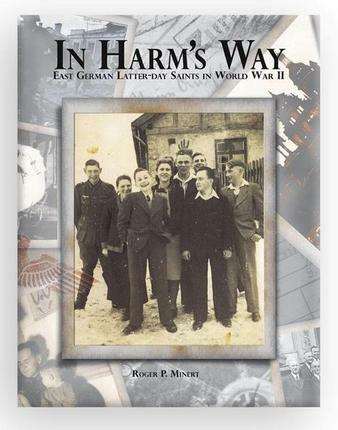 Minert has successfully carried out the immense task of recording the names and biographical details of all the Saints who lost their lives during the war-time period. As well, he has interspersed narrative passages or vivid and valuable reminiscences drawn from his interviews. Naturally the main focus is on the shattering events of 1944-5, when East Germany was assailed by the relentless bombing campaigns by the American and British air forces, and then conquered and ravaged by the invading Soviet armies. Many families were expelled from their homes, or had already fled to find refuge elsewhere. The perspective is of course that of the victims, who sustained each other by their devotion to their Mormon faith. Inevitably there is considerable repetition in these accounts, which, predictably, emphasize the sufferings endured, often heroically. The large number of surviving photographs, which Minert has reproduced, add to the immediacy of the narratives. In his conclusion, Minert touches briefly on the vexed question of Mormon attitudes towards National Socialism. A small number, possibly five per cent, joined the Nazi Party, but the vast majority remained passive though loyal citizens. Nothing in their religious heritage led them to oppose the ruling power, or to refuse to join in its aggressive wars. Any opposition would have led to personal and collective suffering. “If there is any question of guilt on the part of the Latter-day Saints for tolerating an evil government (and in my mind there is not) they certainly paid a terrible price for their lack of action” (519). tribute from a dedicated fellow Mormon in distant U.S.A. If you would like to subscribe to Contemporary Church History Quarterly and receive e-mail notification when each new issue is published, just send an e-mail to kjantzen[at]ambrose.edu with the word SUBSCRIBE in the subject line. Please be sure to include your full name. Contemporary Church History Quarterly (ISSN: 2291-0786) is a free, open-access journal.